I'm posting a single photo/scan and talking about it. This stuff normally loses it's meaning quickly (thus ephemera) so hopefully this makes the magic lasts longer. 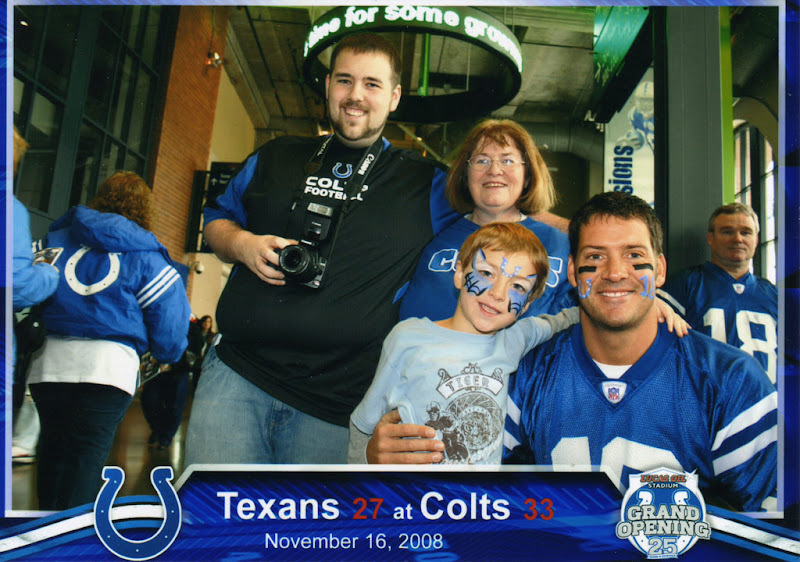 For the 2008 football season, I worked for the Indianapolis Colts as a photographer. This sounds like a dream come true. Regrettably I was asked to take pictures of the fans. Still not bad, I get to be there in the new Lucas Oil Stadium and see the game in person right? Sure, but I also had to take 200 pictures a game. I never reached my quota even once. It was so weird showing up to a job I knew I couldn't do, but they kept asking me back. The problem lies in my greatest fear. You know how most people are deathly afraid of public speaking and would cry if they had to be in front of 63,000 people? I'm the opposite. I freak out if I'm part of the 63,000 fans there. As the stadium filled and the crowd swelled I would freeze up and I wouldn't be able to approach anyone to take there picture. In the end it was alright though because I got that sweet picture with my mom, my cousin Eli, and my Uncle John.